It came preformated with FAT32. Overall performance with FAT 32 on WIndows 7 x64 HP EliteBook 8560w USB 3 drivers enabled write speed 47 MB / sec read 120 MB / sec. On Ubuntu 12.04 x64 HP EliteBook 8540w USB 3 driver enabled (see lsusb output below), write speed up to 90 MB / sec read average 101 MB / sec. After removing partitions I ran bench-marking software from Disk Utility on Ubuntu, write speed up to 96.3 MB / sec but average just over 80 MB / sec. 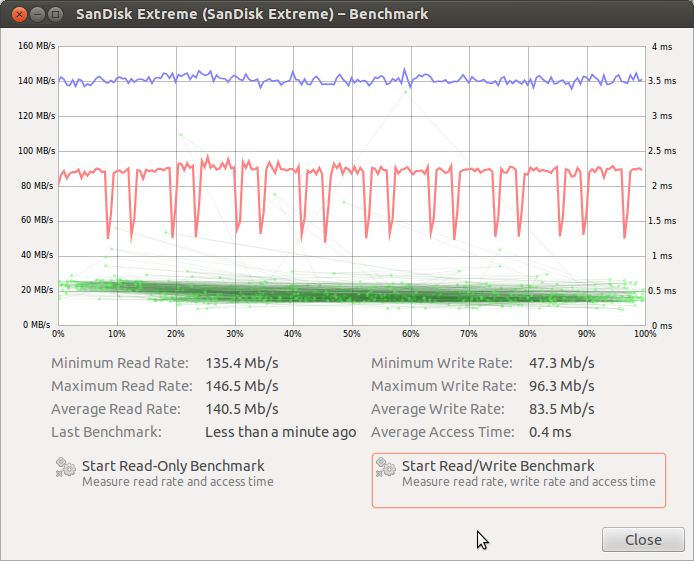 Read speed maximum 146.5 MB /sec on average 140.5 MB / sec see graph below. Bus 004 Device 011: ID 0781:5580 SanDisk Corp. Overall looks are fine, but product is too large (see photo below), so I can not work my mouse, USB 3 slots are only on one side of my notebook, same on all others in our office. 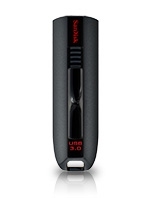 Other USB flash drives we use are significantly smaller, person can work and have it plugged in, not this one.